Following on from our last workshop, this will be a refresher for your skills and also an opportunity to refine and develop, as well as being open to those new to the craft. 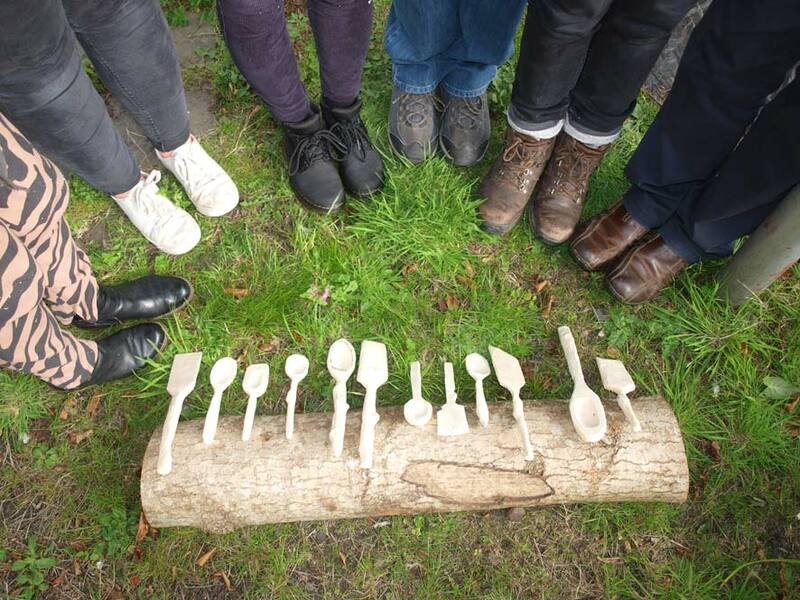 During this intensive day, you’ll have the opportunity to make both a spoon and a spatula, although you may wish to concentrate on producing a single, more finished piece to take home. You’ll leave with a thorough understanding of the process, and may even have produced something unique you’ll be proud to give as a festive gift! Ideas will be suggested for making these not only functional, but decorative and artistic, working with the form the wood has suggested, following the grain once cleaved. Once again you’ll be working from ‘blanks’ – rough shapes cut for you with an axe and draw knife from fresh greenwood, although you’ll also be able to see how this is done. 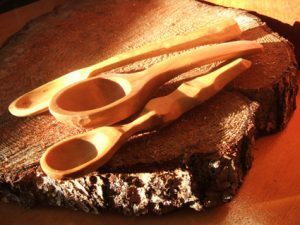 There’ll be a selection of shapes to choose from which you’ll carve using specialist tools such as a Scandinavian-made hook knife and straight carving knife. You’ll start with practising the basics at your own pace, while gaining a thorough understanding of the safety and awareness needed when using these tools. Once learnt, you’re then free to enjoy this highly enjoyable, often immersive and relaxing creative art form. Steve Bretel works across several platforms as a fine art painter, maker and enthusiastic educator. He works from his home studio in Fife, and from a forest hut at Falkland Estate, and will be on hand throughout the day to give demonstrations and guidance, in a supportive and fun learning environment.